It is surprisingly easy to be stylish and functional at the same time while travelling. 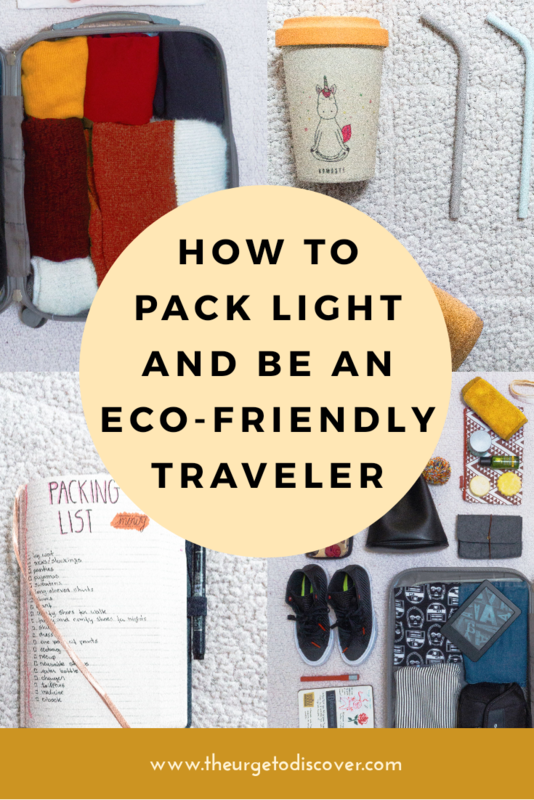 I’ve been traveling with only my carry on luggage and will show you how to pack light, while being eco friendly and stylish. It can be very liberating when you travel with only the things you really need for a trip. You start to realize how little you need the stuff you’ve left behind. With less objects to carry and worry about, you are free to focus on the experiences and adventures. You consume less, don’t stress, enjoy more. After all, isn’t that why we travel anyways? Check what you want to do, where you want to go and the weather on the city you’re going to visit. For the weather, I like to check out AccuWeather. They have a monthly view where you can plan ahead – and it is for free. To plan my activities, I use Google Maps and save all the spots I want to visit. That way I can sketch an idea of each day I’ll have there (I prefer not to have a fixed schedule because I love spontaneity and “getting lost” while I explore). Knowing those things, you can better choose your clothes. First things first, it is good to pack early. Packing at the last minute is a crazy rush, making you just pile up whatever you think you -might- need, without giving it proper thought and consideration. 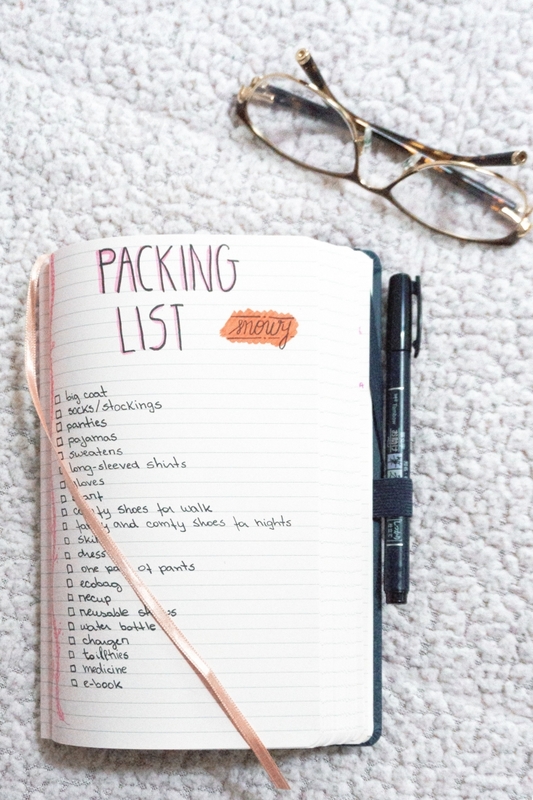 Make a list and pack at least 2 days before. Chose 3 to 4 coordinated colours so you can mix and match each piece to create multiple outfits for different days, or even different occasions. For women, a pair of pants, a skirt, a versatile dress along with 3 shirts, a long-sleeved shirt and a sweater (depending of the weather) are the basics to create many looks. For men, two pairs of pants, one shorts, 3 shirts, and two long-sleeved shirts. Don’t forget the coat and scarf if needed. Check if it will be raining, so you can bring a waterproof jacket. Bring a very comfortable multipurpose shoe for walking and another one for fancier occasions. Wear the heavier items on the plane/train (like winter coats, big scarfs, boots). Don’t pack more than a week’s worth of clothes. Plan to do laundry along the days instead. 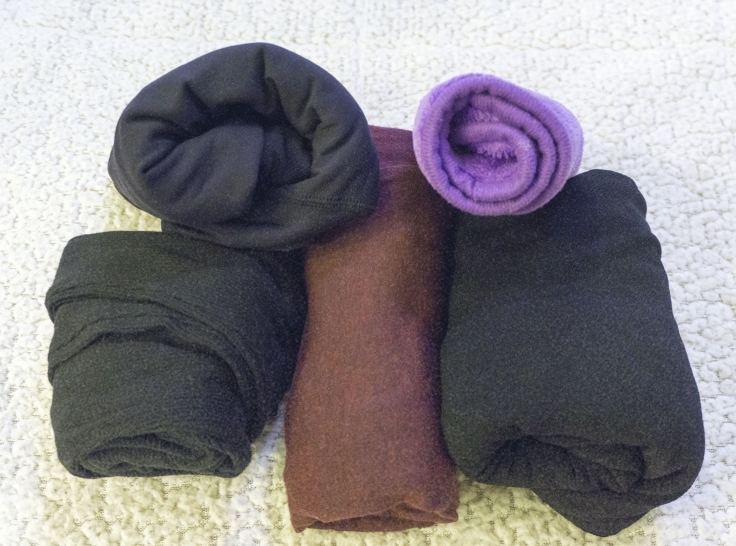 Roll your clothes instead of folding them. I usually fold only the bigger ones and put them on top. It minimizes wrinkles and maximizes space. 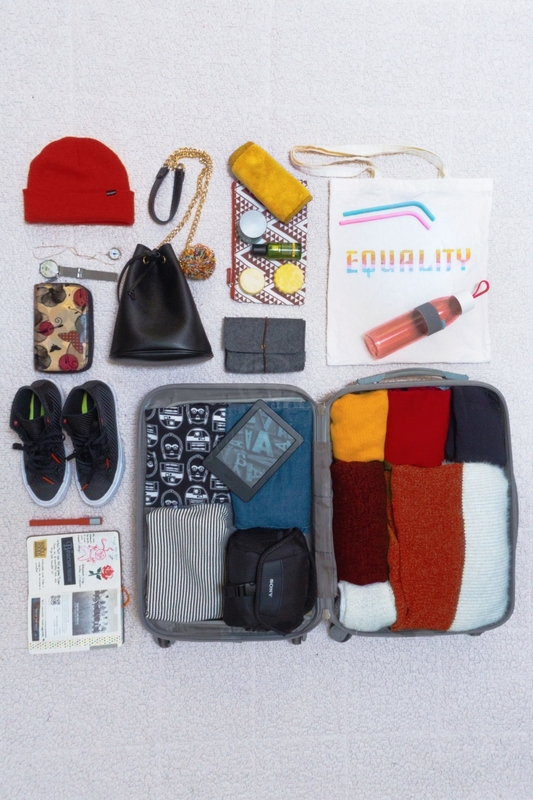 Same thinking as the capsule luggage: what do you REALLY need here? For makeup users, reducing the toiletries bag can be challenging. I’m not a daily user of makeup anymore, so the items I bring with me on trips are basically an eyeliner, brow pencil and moisturising lipstick. I feel more reassured and with less pressure about being myself since I took makeup off my daily life. Plus, it helps our goal which is to pack light. In addition, shampoos and conditioners can be found (or made) in bars – saving space and time on airport security checks. 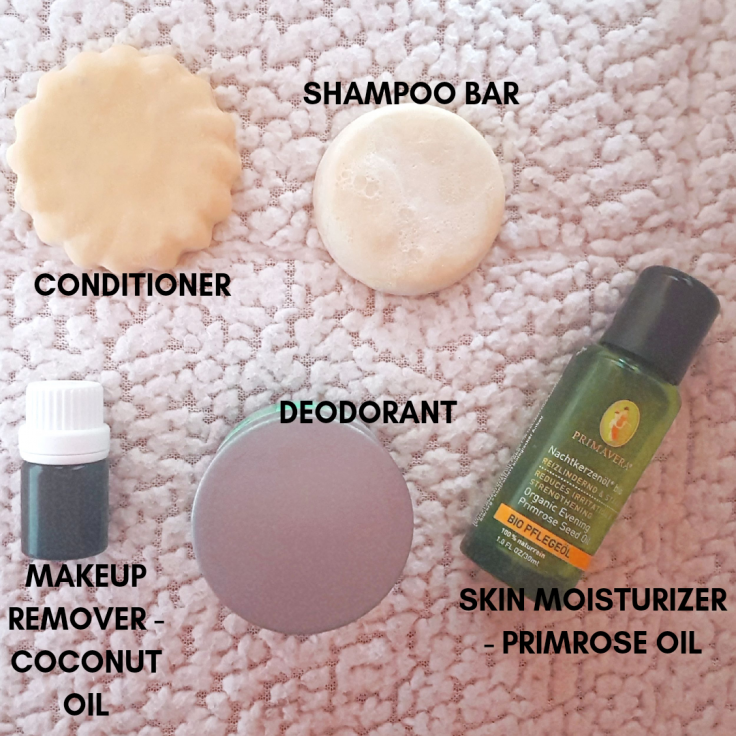 To remove makeup, coconut oil and/or a makeup remover cloth are great. Rethink – refuse – reuse – reduce – recycle before thinking about wasting. Every little thing you can do to take care of our planet is already something. 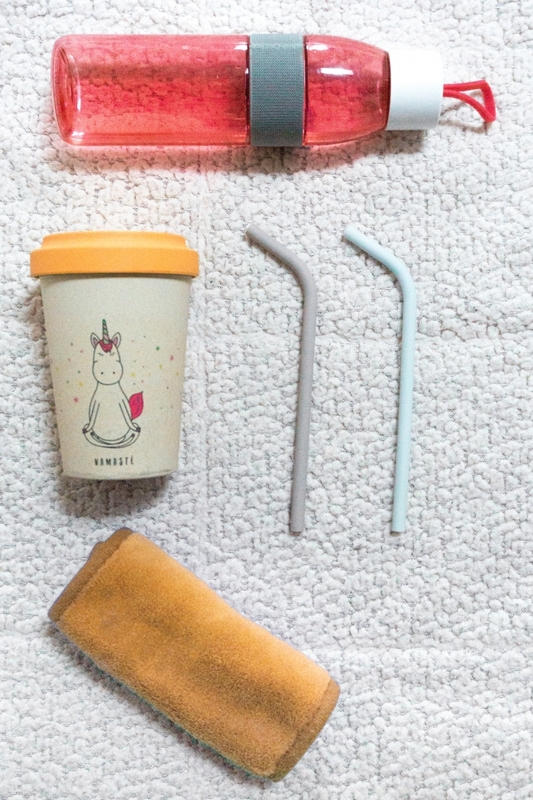 Switching to reusable coffee cups, straws and bottles on your travels (and daily life!) is a great start. Don’t forget your eco-bag! There are a lot of options. You can find cups made of bamboo, metal, recycled material. I love the bamboo one, they are lightweight and keeps my coffee warm for a good time. Bottles are common in glass, metal, durable – and BPA free – plastic/recycled materials. I have the same bottle and BambooCUP for 2 years now – use them almost everyday – and they’re still new. The straws come in glass, metal, bamboo and silicone. I have the silicone ones for 5 years now. I prefer them because of their flexibility – I have a tiny bag where I fold them and bring it everywhere I go. Also, don’t buy something only because a company says is ‘eco-friendly’, ‘green’ or ‘sustainable’. These have become buzzwords. Read labels, stories, ask questions and recommendations. That’s the best way to find out if the company cares for social, environmental and economic good. As budget traveller as you and I may be, cheaper is not always better. Go for the durable and degradable options. It will be cheaper in the long term. If you enjoyed this article, please take a moment to share, pin or bookmark for later! I like the silicone straws, they the easiest ones to clean. 1. I LOVE That you’re like “screw it with the makeup”. I do the same thing. 2. I had NO idea that shampoo and conditioner came in solids. That’s mind blowing to me and such a great idea. 3. Great post!! This will be very helpful for my two week trip coming up in a few weeks! I love your ideas here- I also make a point out of only travelling with a carry on, or even better, a backpack as often as possible. I hadn’t considered the impact on the environment as well, but of course it makes sense! Gosto da ideia de poder viajar com o mínimo possível, levando tudo o que vamos precisar, porém, sem excessos. E principalmente, amei a idéia dos cuidados na escolha de produtos reutilizáveis. Nosso planeta agradece e nós também!! Parabéns, Ju!! These are all great tips! I’m going on a trip in May so this was very helpful 🙂 thanks for sharing!